TODAY’S GAME:The Generals and BayBears play a double-header today at Pringles Park, with first pitch of game one set for 12:05 p.m. The Generals have won the series taking each of the first 3 games. Jackson is 2-2 in 7-inning games this season. WALL FALLS: During the storm that postponed yesterday’s game with Mobile and sizable piece of the centerfield wall was blown down (see picture). 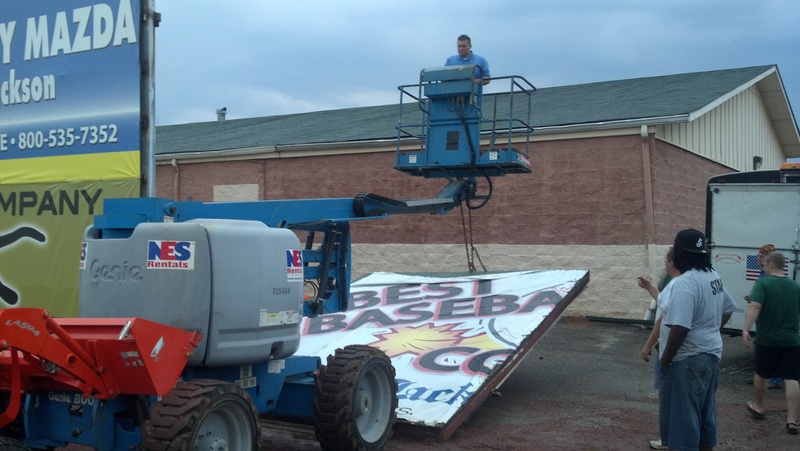 A crew led by Generals GM Jason Compton worked into the night to get the wall ready for play today. WHO’S HOT? : INF Eric Campbell has hit safely in 7 straight games with 3 multi-hit games, batting .367 (11×30) with 8 runs scored, 2 doubles, 1 triple, 1 home run and 8 RBI. – LH Bobby LaFromboise has allowed only 1 earned run in his last 17.2 innings in relief (0.51 ERA). During his last 12 relief appearances he has limited opponents to a .175 average (11×63), while walking 4 and striking out 22. – LH Brian Moran has allowed only 1 earned run in 20.1 innings in relief, going 1-2 with a 0.44 ERA in 15 games. Moran has limited oppnents to a .239 average (17×71) with 3 walks and 18 strikeouts. He currently leads all relievers in the Southern League with the lowest walk per 9.0 innings (0.93).